If you're really on a budget, maybe the Lenovo IdeaPad 100 is right for you. Maybe. Maybe. Lenovo intends for the IdeaPad 100 to take on Chromebooks, and thus it's selling these laptops for as little as $300 with Windows. Not bad, Lenovo. But—and this is a big but—that price is only possible by taking a significant performance hit. Don't expect to do much on this laptop besides type up documents and browse the web. The design of the IdeaPad 100 is as inoffensive as possible. It is just a black rectangle with a slight carbon fiber-esque texture on the lid. It is the mid-size sedan of laptop designs, a.k.a. perfectly average in every way. And that's not necessarily a bad thing—when you're buying a laptop for this cheap, having it look "like every other laptop" is decidedly better than having it look like a cheap laptop. The IdeaPad 100 model we took a look at is also a bit smaller than some of the competition, coming in at 14 inches with a glossy 1366x768 display. It's not a fantastic screen, but the viewing angles are quite a bit better than, say, the Acer Aspire E-15. And while color accuracy is (no surprise) poor, colors do seem to pop a bit more on the IdeaPad 100 compared to most of the competition. Build quality is fairly solid, apart from some flexing at the bottom of the screen. The IdeaPad 100 feels like a laptop you could throw into the bottom of a bag with some textbooks and not worry about it. It's light on ports, with merely power, HDMI, Ethernet, a unified headphones/microphone jack, and two USB slots (one 3.0, one 2.0) on the left side. There's a card reader on the front. Nothing at all on the right. 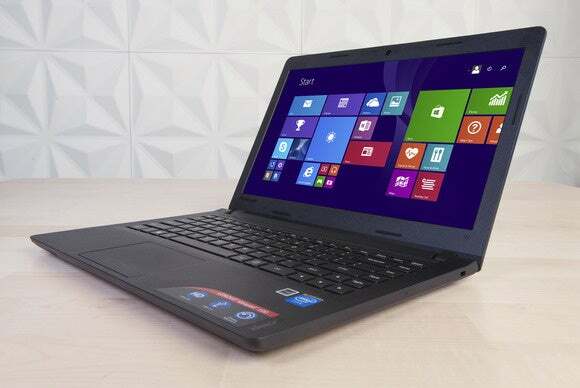 The IdeaPad 100 is amazingly low price but outclassed by competitors in its class. The keyboard is surprisingly nice, with a decent amount of click to the keys. You lose out on a numpad by downsizing to a 14-inch laptop, but…will you really miss it? Though on that note, it is odd that Lenovo decided to nix the numpad but still include a column of keys dedicated to the Home block (Delete, Home, End, Page Up, Page Down). It seems wholly unnecessary. The trackpad is finicky, to put it politely. For some reason the trackpad seems to have no problem as long as I place my finger flat on the surface before dragging. If I try to use the tip of my finger however (like I'm pointing at the trackpad) it tends to only register half of my swipes. Considering that's how I typically use a trackpad, the IdeaPad 100 and I are constantly fighting. Your mileage may vary. At least it has physical mouse buttons, though. The sound quality is predictably terrible—almost all treble, and I managed to get it to crackle and distort just by turning the volume up to 100 percent on a YouTube video. I can say in all honesty that I get better audio quality out of the speaker on my Nexus 5 phone, which isn't saying much. The IdeaPad 100 is amazingly low in price but outclassed by similarly-sized competitors. Simply put: The IdeaPad 100 does not hold a candle to the competition laptops here, performance-wise. It's not the worst in its class, but it's closer to the Atom-powered Acer Aspire 10 than it is to the Core i5 5200U powered Acer Aspire E-15 (to say nothing of our performance king, the Toshiba C55-C). But that doesn't necessarily matter, provided you can find the IdeaPad 100 for cheap. As a $300 laptop, the IdeaPad 100 isn't a bad choice. I wouldn't buy it for more than that, though. Our IdeaPad 100 unit was powered by an Intel Celeron N2940 clocked at 1.83GHz with integrated Intel HD Graphics, 4GB of RAM, and a 500GB 5,400 RPM hard drive. In PCMark 8 those specs translated to a Home Conventional (i.e. web browsing, video chat, word processing, et cetera) score of 1,339. That's a precipitous drop from the Toshiba C55-C's score of 2,527—which is itself a drop from your average gaming laptop's score of around 3,500. Things are even worse when you need real performance, though. With a Creative Conventional score of 1,083 and a Work Conventional score of 1,631, the IdeaPad 100 barely edges out the scores of 801 and 1,382 posted by the Atom-powered Acer Aspire 10. And it doesn't even come close to the 2,198 and 2,771 posted by the C55-C.
And if you want a more real-world measure of performance, just check out our Handbrake test. We feed the laptop a 30GB MKV file and see how long Handbrake takes to transcode it. With the IdeaPad 100, it was a staggering four hours and nine minutes (compared to two hours and twenty-nine minutes for the C55-C). One last note: Lenovo's done something weird with the hard drive: Aside from the usual handful of partitions created by Windows 8.1, there's also a 25GB D: drive partition titled "LENOVO." I assume this is to facilitate its OneKey Recovery, but I felt like it was worth pointing out you lose another hefty chunk of drive space in the process. 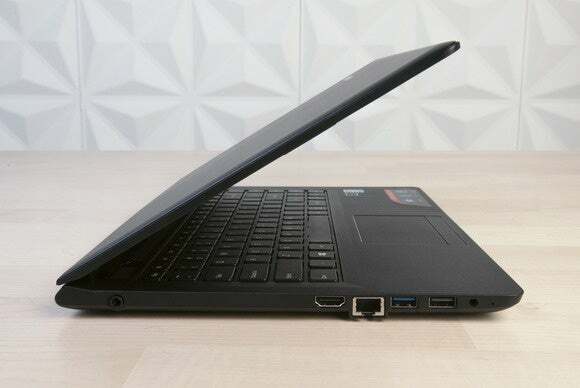 Considering Lenovo was the key player in the recent SuperFish controversy, it's definitely worth taking a look at what third-party software is installed on this el-cheapo laptop—and see whether Lenovo has learned its lesson. My initial impression? Maybe. With the exception of my least favorite antivirus software McAfee, most everything preinstalled on the IdeaPad 100 is either made by Lenovo or is Lenovo-branded. That includes file transfer software SHAREit, OneKey Optimizer, Lenovo EasyCamera, Lenovo Experience Improvement, Lenovo Reach, Lenovo OneKey Recovery, and more. Overall, I'd say Lenovo actually wins this category. While I'd absolutely uninstall most of those Lenovo programs to free up space, at least they're all first-party native Lenovo programs. They didn't even include apps like Netflix or Spotify on this thing! Fantastic!